I don't really do celebrities. By that I mean, I don't really care if someone is a celebrity. I see that largely as just a different job that pays better than what I do for a living. There are many jobs that pay better than what I do, I work in the public sector. I don't necessarily understand or appreciate this idea that there are magazines dedicated to people who do different jobs than most of us and are largely better looking than the average American. Movie and television personalities whom, based upon there ability to act are somehow fawned over. The same holds true for athletes, and now people who are famous for nothing except being on a reality show, at most. I have varying theories as to why our culture idolizes celebrities. I think mostly it has to do with the fact that we think they're better than we are. Otherwise why would they get to live such "glamorous" lives? And ultimately we're not happy with who we turned out to be. There is an entire industry, built upon the entertainment industry that wants us to believe just that. If we only buy a certain pair of jeans or a particular car we'll be more like Brad Pitt, or Gwyneth Paltrow or some other celebrity. I don't really know who is "hot" right now. I'm out of touch. It is to this end that you'll never find me asking someone for their autograph, or taking a photo of /with them. I think there are probably exceptions I'd make if I felt a particular connection with someone. A professional cyclist, or Hines Ward perhaps. But largely, I don't really care all that much. An older guy was sitting in one of the chairs, waiting on his flight to LA, it was Martin Sheen. After everyone went back to their seats and things had calmed down, he looked at my daughter and said "How old is your little girl?" This began a conversation between the two of us that lasted about 10 or 15 minutes. We talked about my kid, his four kids and what I did for a living. I asked him what brought him to Pittsburgh and he told my daughter, though I'm not sure she cared, that she had the same birthday as one of his boys. 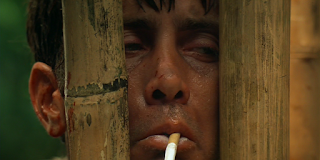 "That Estevez guy." At the end of the conversation we simply left on our separate flights, but I was impressed with this guy. I thought he was a good actor, though I've never seen the West Wing, actually the only thing that comes to mind for me is Apocalypse Now. But I appreciated how much he spoke to me, just like a regular guy, how nice he was to my kid a lot more than any of that other stuff. Most people I know who meet celebrities typically tell you what jerks they are in person. In the case of Martin Sheen, nothing could be further from the truth. Today's Friday Find is an under-appreciated wine here in the Northwest, but really, worldwide. Grüner Veltliner. Maybe it's because of the umlaut. Or maybe it's because rather than in the renowned vineyards of France where many of the most "glamorous" wines find their origin, Gruner comes from places like Austria and Slovakia. 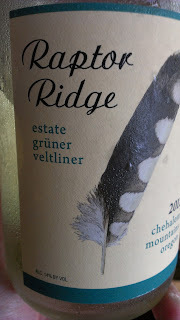 But make no mistake, Gruner sings with food and it's fruit forward palate and zesty acidity makes it fun to drink along. The 2012 Estate Grüner Veltliner from Raptor Ridge comes from their Tuscowallame Vineyard. It's loaded up with citrus notes of lemon zest and lime and along with a touch of stoniness it brings in great acidity. You can order direct from Raptor Ridge here, and at $20 it's a nice way to bring your friends around to a few new, not so celebrity wines.